Racin’ Today » Ingram: Hamlin, JGR Hitting Stride Just In Time? Ingram: Hamlin, JGR Hitting Stride Just In Time? 3. Dale Jr. has that ol’ winning attitude back. Pissed, he was still racey in a 21st place finish and dissed MkM for putting him into the wall. 4. Re Milwaukee Mile: Kudos to IZOD IndyCar for returning. Close race but small crowd confirmed more than good racing needed to fill seats. (In 2010 after a race at Road America in August, I stopped in to check out the Milwaukee Mile, concerned that racing would not ever return. I had not ever seen an event at the track, much less the track itself. Odd track when it comes to facilities – there are virtually none in the infield – odd location at the back of the cluster of fairgrounds buildings with little parking close by and poor management seemed to have doomed it. 5. 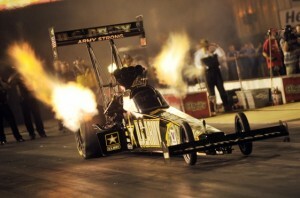 Tony Schumacher hits 322 mph in 1,000 feet at Bristol. Amazing. Kyle Busch hits 213 at Michigan. 6. 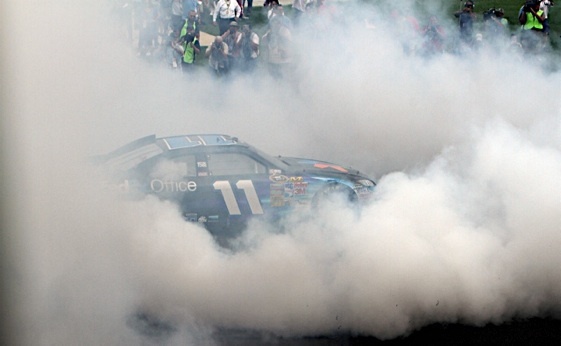 It’s not the 11 car that has been a bust at JGR or the oil pans. Whatever happened to Sliced Bread? 7. Will NASCAR track owners start replacing sparsely populated grandstands with some alternative? (It’s been clear for quite some time that the tracks were overbuilt as a result of the surge in popularity in the 1990’s such as the additional stands in Turns 3 and 4 at Michigan. In addition to the economy and the early doldrums of the COT, tracks continue to have trouble with the transition to a new generation of fans, including a younger demographic and an increase in upscale ticket buyers. 8. 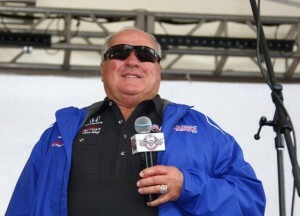 Foyt feature on TNT had some great video. A.J. says he was one of the best, not the best. With age comes grace. (Ironically, it was at Michigan that Foyt had a practice crash in 1981 due to a tire problem that altered the course of a great career. The resulting concussion, which required hospitalization, was the worst injury of his career up until that point. That crash at Michigan occurred prior to a CART race, hence was not part of the NASCAR-themed feature on TNT. But the results were far worse than the spectacular crash at Riverside during a NASCAR race replayed by TNT. Foyt went from being a great driving talent to a very good driver as a result of the concussion at Michigan. Nevertheless, A.J. became a winner again in sports cars, capturing the Rolex 24 at Daytona in 1983 and 1985 in extraordinary drives, plus a victory at Sebring. In 1983 at Daytona, after his original entry broke early Foyt was recuited by another team. Without any prior experience, he got in one of the most evil-handling race cars of any era, a Porche 935 turbo. His morning drive in the rain was decisive in the victory. 9. The Grand-Am finally arrives at the Brickyard 400 next year after testing in 2009. To be more popular inside the GA paddock than out? 10. RT @willbuxton I’m impressed that @EJVISO seems to be tweeting in two languages from the cockpit right now. Bravo Sir. 11. 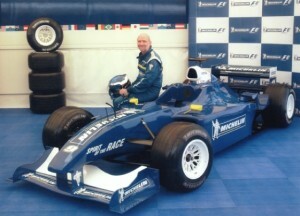 At long last, I can compare notes with Tony Stewart about driving an F1 car. Jonathan Ingram and his Arrows. Quote of the Week: “I perceived that he didn’t know I was on the outside. He come up there, he knew I was up there, but, he was just running hard. If the tables were turned, I would have been smarter and give him plenty of room, more than he did me. He is older than me, been racing forever and knows a lot more than I’ll ever get or he has forgot more stuff than I’ll never know. Still, I take better care of people than that.” — Dale Earnhardt Jr. after being forced to check up by Hendrick Motorsports teammate Mark Martin and then hitting the wall at Michigan. I want so bad to see FORD stuff an updated COSWORTH in the @ss of something that handles……for Indy and F 1…..take on Honda and Euro teams like Henry the Duce would have wanted. real deal TENNESSEE LIGHTING than SLICED BREAD…..
#21 flat out RACED to his win.